Spring is such a great time of year and it finally seems to have arrived (or mostly arrived) for most of the country. One of our favorite spring flowers is pansies. They can handle cool weather, so you don’t need to worry about a late spring frost, and they are easy to plant and inexpensive to buy. The only problem is that they don’t like the heat, so their life span is shorter than the average annual. If you’re in the north and itching to add some color to your gardens, but still susceptible to frost, you’ll want to pick up a few flats of pansies. 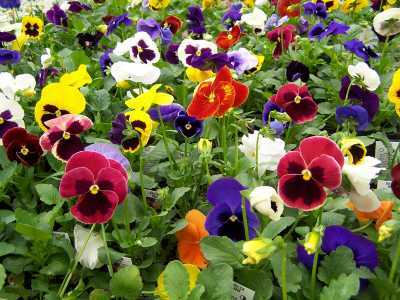 One of the reasons we love pansies so much is because they are available in such a wide variety of colors, particularly a lot of bright ones. Whether you have an aluminum fence or a vinyl fence, you can be sure to find some pansies that contrast and make your backyard one you can be proud of. A vinyl or aluminum fence can add curb appeal and safety to your home, but a bit of landscaping and some flowers in conjunction with your fence will really make your backyard look great! If you’ve already planted some pansies by your WamBam Fence, snap a picture and post it to our Facebook page or email it to iwant2win@wambamfence.com. We love to see our customer’s pictures!